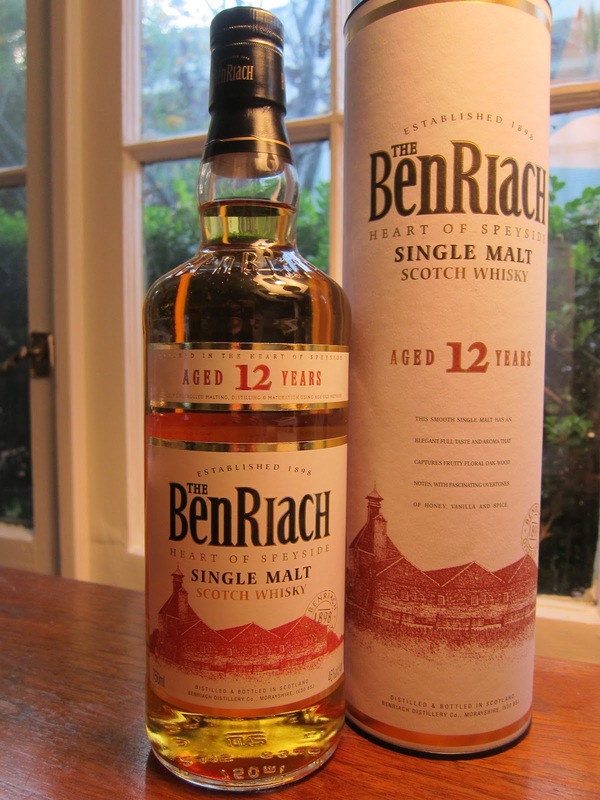 Benriach 12yo (46.0%): Damn time difference (again)..! Wednesday morning when I woke up and opened my laptop I knew right away that I was late for another heated discussion. Apparently all hell broke loose when Brown Forman's acquisition of BenRiach Distillery Company Ltd in a £285 million ($416 million) deal hit the news when I was asleep. The massive deal includes all three distilleries; BenRiach, Glendronach and Glenglassaugh as well as the maturing stocks in the warehouses, bottling plant and the headquarters in Edinburgh. Well, I am not going to hide that I felt pretty sad to see another influential independent distillery company go down in history but I keep my hopes high that Brown Forman will take good care of the brands... To be honest the last thing we need to see these days is another whisky brand relaunched in an overpriced perfume bottle filled with immature and rushed whisky... Anyway, long story short that's how I ended up uncorking this long time discontinued Benriach 12yo bottle tonight. The distillery stopped bottling this whisky right after they introduced their NAS expression Heart of Speyside and before the launch of the current 10yo expression which is blended using only post resurrection distillate. But Benriach 12yo was the introduction of the brand for me when they first started to export their whiskies to this side of Atlantic after the distillery reopened in 2004. We all liked it back then, both the juice in the bottle and its independent spirit around it... I will fill my glass now and raise it to celebrate BenRiach's new chapter and wish them the best under the new ownership. Color: Medium - Light amber... Yellow gold. Nose: Honey syrup and vanilla. Pear and apple compote. Kiwi, Granny Smith apple slices and green tobacco leaves. A very inviting nose, I barely can keep myself from tasting it right away. After giving it some time to air I get now fresh rosemary leaves, toffee, grilled pineapple slices and toasted pine. Now I don't want to let it go... It's getting better and better also thicker: PX vinegar, beef stew and poached quinces. A few drops of water add a few extra green notes: Fresh cut grass, asparagus and dandelion leaves. Palate: Way more sherry cask influenced than I was prepared for after what I got from the nose. Creamy, almost silky texture and full bodied. Cinnamon, nutmeg and spiced rum. Toffee brittles, salted almonds and roasted hazelnuts. The palate is way nuttier which caught me by surprise after a very fruity nose. Adding water makes it sweeter, it now tastes like a rum cask finish: Brown sugar, molasses and ginger snap cookies. Finish: Sweet and malty. Medium long and slightly peppery. Lemon peel and orange wedges. Overall: Ok... This is not even close to what I remember about this dram. It was a pleasant surprise actually... Somehow I was remembering a dram carrying mostly bourbon cask notes (maybe wishful thinking...) but on the contrary this is a proper sherry cask influenced whisky. Well, it is not a secret that lack of bourbon casks always makes me less happy but this is a very solid Speyside single malt nobody can complain about. Especially with it's price tag about $40. You might still spot them on dusty shelves around. Definitely grab one if you see one. It's a no brainer and a nice bottle to have in your whisky cabinet from the old times of Benriach.